I plan on fixing the Roller issues for this summer's Roller 4.0 release. I won't have time to fix the Propono issues for the upcoming Propono 0.5 release (due this week), so they'll be in 0.6 sometime after JavaOne. I was wondering what web services vendor WSO2 was doing at the APP interop event. Turns out, they've got a "Web Services Mashup Server" in the works. The Atom Publishing Protocol interop event is over and now I'm catching up on blogs and email in my hotel room in Mountain View, CA. In the end, I was able to run ROME Propono successfully against Blogger/GData, AOL Journals and Wordpress. I also found a dozen small problems in Propono and in the Roller APP server. For more information on the event, check O'Reilly's Keith Fahlgren's summary of the event titled Atom Publishing Protocol a Success. Keith mentions that "big industry players like AOL, Google, IBM, Microsoft, Oracle, and Sun are working on APP clients and servers and sent people to the interop event with interesting code" and I agree that's definitely a good sign for the protocol. I thought it was particularly interesting that database vendors IBM and Oracle showed up with DB2 and Oracle-backed Atom stores. If Google's half-dozen or so Atom protocol based services aren't enough make you stand up and take notice, surely that should get your attention. Day one of the Atom Publishing Protocol (APP) interop event was a success, at least from my point-of-view. 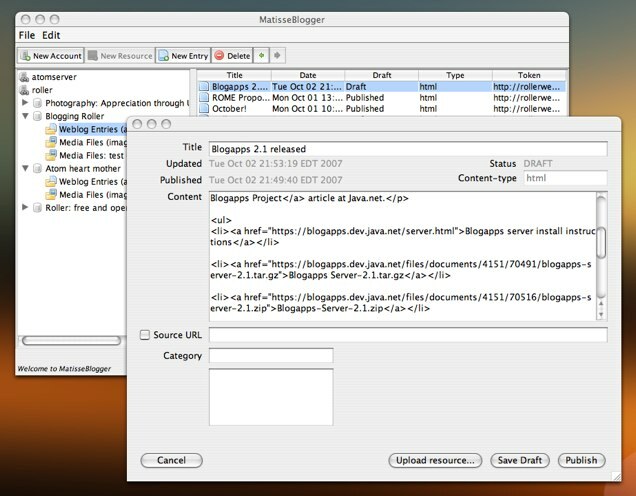 I was able to test the Propono client against Blogger.com/GData, AOL Journals and an implementation from Oracle. I found and fixed problems in Roller's APP implementation. Plus, it was great to meet all of the good folks implementing Atom and to get a close look at the Google campus. I'm getting ready to drive back to Google now so... gotta go. Check out Tim Bray's blog for some photos of the event. I just got approval to attend the Atom protocol interop event at Google April 16 and 17. I'll be bringing at least three Atom protocol implementations: Roller's Atom server, Propono's simple file-based Atom server and Propono's Atom client. I've heard the argument before that the REST approach to web services doesn't give you reliable messaging and that's the reason you need to stick with WS-*. Today Bill de hÃra disputes that notion with an interesting and somewhat provocative post that mentions a couple of specs for messaging via HTTP (HTTPLR and BTF) and argues that Atom protocol can serve as the basis for web-scale reliable messaging. Bill de hÃra: There are a number of reasons to choose Atom Protocol as the substrate for web-scale reliable messaging. First, a ton of software will be written to target APP in the next few years, and there is plenty of scope for extending the protocol; this suggests openly available and flexible software stacks. Second, since all document collections in Atom Protocol are served as Atom Feeds, it has inherent support for systems management and end to end reconciliation. Third, Atom entries have identity and are natural envelopes, unlike SOAP, where identity and true enveloping requires further specification (essentially raw Atom presents a better basis for interoperation than raw SOAP). Fourth, Atom Protocol can support binary content transmission not just XML, and thus can transmit arbitrary payloads. Finally, because Atom Protocol respects media types and deployed HTTP infrastructure, independent proxy inspection and security check-pointing can be installed cleanly, also eliminating the need to rewrite 2 stack layers and buy XML appliances to support and secure SOAP backed web services. It seems to be a question of when, rather than if, this will get built out. I would have blogged about this earlier today, but Bill's blog looked foobar and I didn't realize that today is CSS Naked Day. My blog doesn't look half bad naked. Jeffrey Blattman has put together a new Portlet that makes it possible to blog via Atom Publishing Protocol (APP) from a portal page. He's added it to the Open Source Portlet Repository on Java.net so you can try it out against your favorite APP server. James Snell brings news of an Atom Publishing Protocol (APP) interop event to occur in March at the O'Reilly E-Tech conference. I'd love to use that as an excuse to go to to E-Tech, since my current work involves APP in ROME and Roller, but it sounds like I can participate remotely. Joe Gregorio announces a new Atom Publishing Protocol Spec (draft #12) and he says it might end up being the final. I guess it's time for a new Blogapps release with APP draft #12 and ROME 0.9 support. Plus, Joe has put together a set of new planet sites for towns in the Charlotte, NC area; all based on feeds from Google Base, Google Blogs, Google News, Craigs List, Flickr and the Weather Service. The sites look useful, but the ads combined with the minimalist design make them look a little spammy on first glance. Perhaps a short "about this site" paragraph is in order.